This 2700 million year old gold-bearing conglomerate contains rounded rock fragments indicating transportation and deposition of these pebbles in water. Such sedimentary rocks, in places as old as 3800 million years, have been found in “Precambrian Shields” proving that some shallow rivers and seas were already present during the Early Archean. 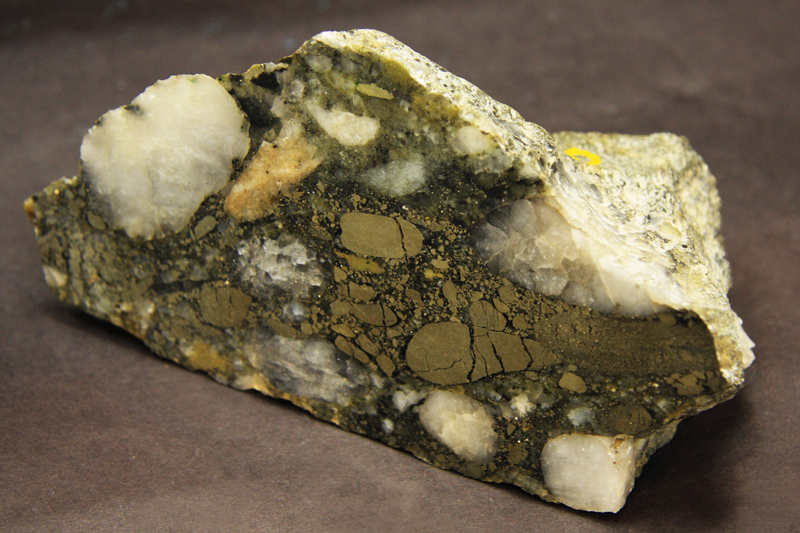 Note that the clasts include rounded pyrite grains that are rarely, if ever, deposited in recent sediments since they are rapidly oxidized and decomposed when in the presence of free oxygen. Therefore the presence of these pyrite grains in this sediment indicates deposition in oxygen-free atmospheric conditions during the Archean.